Need a job? How about getting paid to wait in line? Meet Robert Samuel, a professional line-sitter who takes PayPal, Chase QuickPay and Venmo. Robert Samuel does, and now you probably want to hire him, don't you? His job began as a side-job after he was fired from a cell phone salesman job in New York City. Then, just before the newest iPhone hit stores in 2012, Samuel put his services as a line-sitter on Craigslist and earned his first client. 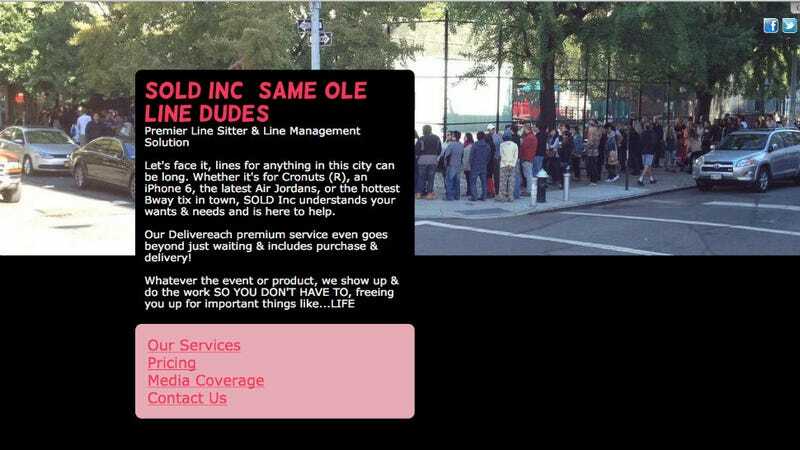 Now he charges $25 for the first hour of waiting and $10 every half-hour after that and even has a posse of line-sitters he manages when jobs get crazy. Samuel stands in line for everything from videos games to cronuts but declines unreasonable requests now, like SNL tickets. "I really don't want to do that," he said. "People are on line for days at a time. We go from 11 at night till 6 in the morning, and you don't get in. With a big show like Justin Bieber, I would probably just tell you no. Tina Fey? Not happening." Related: Why do I have a college degree?